Complexity and risk define our business environment, yet executives must often look in the rearview mirror with reactive hindsight to sudden geo-political risks, tragic natural events, market disturbances and global economic swings. even daily operational disruptions and interruptions are typically handled in a reactive -- instead of proactive, predictive manner, with resultant financial consequences. 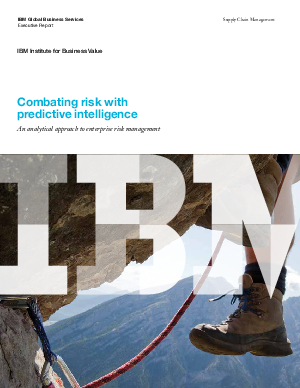 But companies with leading risk management practices are looking forward, applying "predictive intelligence" to proactively mitigate and manage complexity-fraught risks, while bringing significant value to their bottom line and their brand. These forward-thinking organizations see change as an opportunity, and they act on possibilities, not just react to problems. The question is how?